The best thing about being an automotive journalist is the cars. We get to drive the cars. Normally, the cars are supplied by the manufacturers. They are prepared for the road or the track and the journalist is not responsible if the vehicle is damaged. Technically, they might be, but if the manufacturers want their cars tested and reviewed they have to make them available at their own risk. However, sometimes the cars are not owned by the automakers with the deepest of pockets. Rather, they are personally owned cars. That is when who is responsible is a lot more of a gray area. To illustrate how a typical crash might go let us tell you about a journalist crashing a car. It happened at an auto writer’s guild meeting. It took place at a private racetrack and that particular day it was pouring rain. Cats and dogs type rain. Forest Gump “sideways” rain. As a pit-in crew volunteer, this author could have gone out first, before the general members, but opted not to drive. Although I have been to both driving school and race school, I felt my skills did not match the hardware and the conditions, so I opted out, like about a quarter of the membership. The first car out was a Lexus IS-F. This 8 cylinder car had been sidelined due to newness the day before. It was so new that each wheel was missing a lug, where the dealer was to install the wheel lock, but since the car had never been to the dealer – it was directly off the production line, it had to wait for 4 lugs to be retrieved from a local Lexus dealer. A journalist from Asia took the car out. It travelled about 1,000 feet, slid sideways (perfectly sideways actually, it being a well-balanced car) and it hit the first corner wall hard enough to have the journalist shaken up. Despite the obvious driver error, Lexus sucked it up, offered words of wellness to the driver (who was mostly injured in the upper-left ego area) and loaded their now wrinkly IS-F on a trailer. They didn’t even pull their other cars of the track. How’s that for a stand-up company? As you may have guessed, the journalist who destroyed the engine of this rare Porsche 917 was not so lucky. The Star reports that Mark Hale, reporter for Octane and Auto Italia magazines, was driving a Porsche owned by one David Piper, a veteran F-1 driver when he over-revved the engine. Over-revving a modern road-going car is not really possible. Rev-limiters and all manner of mechanical and electronic nannies keep cars form going faster than their design RPMs. 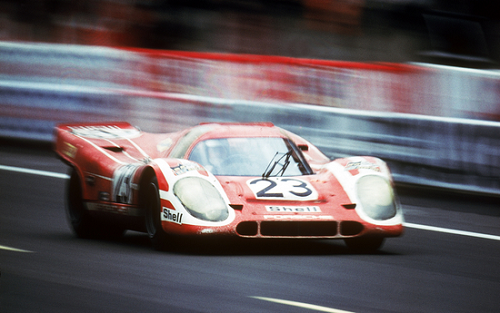 However, the 917 is not modern, and is not a road-going car. Rather it is a circuit racer (See photo). Journalist Hale reportedly missed a shift, or somehow the engine was allowed to over-speed while he was racing a Ferrari on a track. Hale was quoted by the Star as saying “The Porsche 917 is a tough car to drive and it is a matter of fact that the engines blow up. Everyone has done it and I knew this was the case. “I had a conversation with David Piper and he asked me what happens if the engine blows up. “I told him I couldn’t be responsible and he said ‘okay’ but then chose to forget the conversation." Apparently, Mr. Piper did not agree with this line of thought and the parties ended up in court. After the dust settled Mr. Hale was found to be liable for the cost of the engine (about $75,000 in US dollars) and worse, racked up double that in legal fees. For that money Mr. Hale could have bought a new Porsche 911 Turbo. Just for the record, Hale was racing against the Porsche’s owner, Mr. Piper, who was in turn driving his pal's Ferarri. The pal is Nick Mason of Pink Floyd. Note to self – I need better friends. The reason an over-revved engine is a problem is physics. When a piston accelerates away from a crankshaft at more than its design speed, it can separate from said shaft and then it becomes a missile aimed at the cylinder head. The force of that piston equals half its mass times the square of its velocity. Speaking technically, that is a “whole lot a hurt” heading in the direction of the cylinder head. The cylinder head is not meant to contain a piston in this manner and the piston exits the head quite rudely. The other pistons often are the jealous of that piston getting out of the engine and they can follow suit. It is quite exciting for everyone not involved in the ownership of the car. This case is likely to be remembered by journalists the next time they are offered a test ride in a private vehicle. For the Sun story, please click this link. Photo courtesy of Porsche media files. Thanks Nicolas. Hope you feel better soon. The thing is that Hales is not the joyriding "inexperienced journalist" that most people have described him as here. Far from a guy with "no race experience" as you put it, Mark Hales is an accomplished racing driver whose career includes 2nd overall in the British Touring Car Championship as well as a long history very competitive Historic racing including winning the Spa 6 hours outright. He also, despite the events of this fateful test remains Nick Mason's preferred choice of driver to pair up with Martin Brundle in his GTO at Goodwood every year. The fact that the owner of the "other car" in this test still has enough faith in Mark to trust him with £20million or so worth of motor demonstrates a certain level of competence. I do agree however, that the moral responsibility lies with the owner. The you bend it you mend it mentality goes out of the window if none of the people talented enough to drive the car have the cash. You can insure against a crash, but no policy will cover mechanics so if this precedent stands how long till these "guns for hire" get scared off and the historic racing grids turn into processions of rich owners devoid of talent or spectacle. Poor old Pipes is a racing legend, and legally he is in the right. But historic Motorsport requires risks and although this wasn't a race, it was a "racing situation" in which the owner participated. This will have repercussions way beyond journalism.